As you can see comparing them, the text in 2.49.4 is darker and blurrier. This makes reading it practically impossible. This same error has been happening since any build after 2.46 . This is why I've decided to stick with 2.46 . 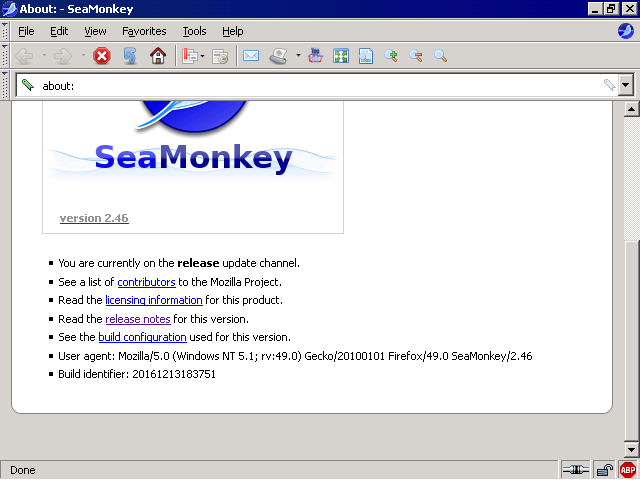 It's the last build of Seamonkey made that actually has readable text. I hope that y'all will fix this problem in the next release. Otherwise I will have to stick with 2.46 . Forever. Have a nice day, and live long. I'm using Win XP Pro SP3 32-bit OS. Have you run Windows ClearType lately? @I seem to recall some kind of interaction between them? Ariel Schnee wrote: .... As you can see comparing them, the text in 2.49.4 is darker and blurrier. This makes reading it practically impossible. This same error has been happening since any build after 2.46 . This is why I've decided to stick with 2.46 . It's the last build of Seamonkey made that actually has readable text. It's not a SeaMonkey problem. It's an OS problem, that you're using. (Not sure that your screenshots are working?